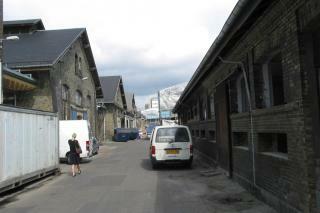 In 1870, the City of Copenhagen bought a property down by the railway. Here, beside the first gasworks in the city, the building work began on a cattle market to replace the city's many filthy slaughter stalls. The Brown Meat City was designed by Hans J. Holm and opened in 1879. From 1888, it was the only place in Copenhagen where animals were permitted to be slaughtered. From 1901, the meat was sold in The Ox Hall", which is now a listed culture centre. But even though the Brown Meat City was originally a large step forward in terms of hygiene, it was already outdated by 1934. So the White Meat City was built instead. " Since the 17th century, there have been butcher stalls at Halmtorvet in Vesterbro in Copenhagen. Actually, until the end of the 1870s, small butcher's stalls were scattered throughout the city. As the city became industrialised, the crowded housing and cholera epidemics increased the focus on public health and hygiene. This was one reason why the city had the Brown Meat City built in 1879 to round up the slaughterhouse industry. An efficient process transformed the cattle in the slaughterhouse into steaks in the meat counter under public-sector control. From 1888, Copenhagen enforced forced slaughter", which meant that all private slaughtering was forbidden and had to be carried out at the public cattle market. "